In recent years, I've been delving (both in law and other disciplines) into strategies and platforms for effective online teaching/learning. I was never a strong proponent of online law teaching in particular because, like many others, I've always felt there's something about classroom interactions that's hard to replace online. And, yes, I know there are all sorts of ABA Standards and other rules that preclude significant amounts of online J.D. instruction, so my experience in the recent past has been with online LL.M. and other similar programs. While I was always leery of online law teaching, I have taken a lot of online courses, and started to teach several, in other disciplines. The technologies have advanced significantly since I first raised my concerns in the mid to late 1990s when law profs in Australia began to worry we'd soon all be replaced by talking heads on computers. I still haven't come to any definitive conclusions about when, and in what circumstances, online teaching can be as good as, better than, or a useful supplement to classroom instruction, but I've recently started thinking about one particular aspect of online teaching: lecture recordings, and how best to make use of them. I've taken, and also instructed, online classes that have no "lecture" component. There may be preset readings or short YouTube videos, or blog posts gathered together as part of the course materials, but no actual formal lectures as such. I've also taken, and instructed, classes where the instruction has utilized either interactive video classes with students (via Skype, Zoom etc) or pre-recorded lectures, or a combination of both. Pre-recorded lectures can be particularly useful in some circumstances: for example, where the course needs to be asynchronous because students are in different places/time zones etc. I've been teaching a few courses recently that require pre-recorded lectures for this purpose. Because these courses are law-related and because I want discussions to be as interactive as possible (even though they're largely asynchronous and use text-based discussion boards), I record new lectures weekly, both presenting new material and reacting to/commenting on discussions from previous weeks. I do this, rather than pre-recording everything upfront, because I want to simulate, as best I can within the constraints of the technology, the feeling of an interactive classroom. However, some people have suggested to me that this is a waste of time and it's easier to pre-record everything because this can give you the benefit of re-using lectures in later iterations of a course in subsequent semesters, and it also gives you the benefit of having everything prepared upfront and not having to fit in lecture-recording at what may become a busy time of the semester. So, yes, this is a finicky point and not many people are probably thinking about it, but if anyone is, I'd be interested in your thoughts. Congratulations to Sharona Hoffman (CWRU Law) on the recent publication of her new book on Electronic Health Records and Medical Big Data with CUP. Here's a quick summary for anyone interested in taking a look: This book helps readers gain an in-depth understanding of electronic health record (EHR) systems, medical big data, and the regulations that govern them. It analyzes both the shortcomings and benefits of EHR systems, exploring the law's response to the adoption of these systems and highlighting gaps in the current legal framework. It also develops detailed recommendations for regulatory, policy, and technological improvements to enhance EHR systems’ safety, security, and efficacy for both clinical and secondary (such as research) uses. Electronic Health Records and Medical Big Data addresses not only privacy and security concerns but also other important challenges, such as those associated with data quality and data analysis. The book can serve as a primer for students and a resource for knowledgeable professionals and academics. This morning, I received a survey from Wolters Kluwer (Aspen), publisher of the IP Survey textbook I use. The survey sought out what I find important in a book, and even asked if I knew any young IP professors I was impressed with (who could presumably write a new book). Why? The casebook authors (Profs. Merges, Menell & Lemley) somehow worked out a deal to take the book "private." That is, Aspen won't be publishing the book anymore, and they will self publish the book for a mere fraction of the former cost. This is just one example of the casebook revolution. Contrary to what students might think, many professors actually do care about casebook prices. Modern technology is finally allowing them to do something about it. The straw that broke the camel's back, I think, came last year, when Aspen offered Dukeminier, et al., as a rental only. That is, students paid for an electronic version and a paper version, could mark up the paper version, but then were required to send the paper version back. The cost was less than the prior full price of a casebook, but not by much. The rationale for this move was obvious: cut out the secondary market. Professors rebelled, and many said they would switch books before they would allow this, and Aspen relented, offering a print version (and claiming that its prior emails saying there would be no such version were misinterpreted). But the handwriting was on the wall: book publishers are looking for a way to extract more and limit competition. Some of my colleagues get angry about that. My view is more sanguine: entry costs are low, so someone should be able to capture the market by simply competing with a lower price. If we hate this setup so much, we should just do casebooks another way. Perhaps not surprisingly, IP and internet law professors have led the way to start doing just that. Independent presses have arisen, open source casebooks have been created, and materials have been shared. You can now get two IP Survey texts (with a third on the way) for around $30. You can get statutory supplements for free in PDF (or cost of printing in paper). These things sell for $60-$90 from publishers. There are specialty casebooks (e.g. trademark or internet law), as well as highly focused reading materials (for example, you can get free access to my internet law readings online, or you can buy it in paper for about $35, if you want my exact reading choices for internet law). Another benefit of the revolution is that new platforms allow for benefits not previously possible. Unlocked PDFs that allow for easy search, cut, and paste. An "open source" feel whereby edits by one professor's edits can be recombined into other books (though standardization of format would be helpful for this). More images, quotes, video links, etc., by professors willing to take fair use positions that publishers might not be willing to take. In other words, the revolution has arrived, and is waiting to spread. Non-IP professors have not picked up on this as much (yet), though the H2O platform at Harvard has several reading lists in non-IP courses. As self-publishing platforms grow and more professors get on board, casebook publishers will see significant pressure. 1. Publishers add value. For the most part, the cheaply available works are not nearly as polished as casebooks. They also contain far less material (which is good and bad - depending on whether the book matches what you want to teach). There are definitely exceptions to both of these. 2. Authors that have more potential upside may spend more time. If you like "notes" that sum up history, cases in other jurisdictions, etc., you are less likely to see those in a self-published book - certainly in the first editions. That work takes time, and simple incentives may limit it. On the other hand, if the author keeps 100% of the profit, then maybe such work will be worthwhile. Creating my own set of materials took a huge amount of time, and I simply had nothing left in the tank to write long notes, introductory text, hypotheticals, etc. But not all works are the same. I have colleagues who have written books with some fine problems in them, for example. 3. Sometimes the published book is just better. I like my patent law book. I like my contracts book. It's going to take a lot to convince me that another book is better. But that's what competition is all about. 4. New systems lack standardization, and thus may not offer all the features we want. Converting my fully online materials to printed materials was time consuming and, frankly, pretty ugly. There are other systems that may work better, and eventually the best ones will shake out. In conclusion, be on the lookout for opportunities to collaborate on new textbooks in new areas, and the next time you complain about high prices, remember that you can do something about it! The Future of Privacy Forum is hosting an academic workshop supported by the National Science Foundation to discuss ethical, legal, and technical guidance for organizations conducting research on personal information. Authors are invited to submit papers for presentation at a full-day program to take place on December 10, 2015. Papers for presentation will be selected by an academic advisory board and published in the online edition of the Washington and Lee Law Review. Four papers will be selected to serve as “firestarters” for the December workshop, awarding each author with a $1000 stipend. Submissions, which are due by October 25, 2015, at 11:59 PM ET, must be 2,500 to 3,500 words, with minimal footnotes and in a readable style accessible to a wide audience. Publication decisions and workshop invitations will be sent in November. Details here. I have a new law review article out, Two Cheers for Corporate Experimentation: The A/B Illusion and the Virtues of Data-Driven Innovation, arising out of last year's terrific Silicon Flatirons annual tech/privacy conference at Colorado Law, the theme of which was "When Companies Study Their Customers." This article builds on, but goes well beyond, my prior work on the Facebook experiment in Wired (mostly a wonky regulatory explainer of the Common Rule and OHRP engagement guidance as applied to the Facebook-Cornell experiment, albeit with hints of things to come in later work) and Nature (a brief mostly-defense of the ethics of the experiment co-authored with 5 ethicists and signed by an additional 28, which was necessarily limited in breadth and depth by both space constraints and the need to achieve overlapping consensus). “Practitioners”—whether business managers, lawmakers, clinicians, or other actors—are constantly innovating, in the broad sense of introducing new products, services, policies, or practices. In some cases (e.g., new drugs and medical devices), we’ve decided that the risks of such innovations require that they be carefully introduced into small populations, and their safety and efficacy measured, before they’re introduced into the general population. But for the vast majority of innovations, ex ante regulation requiring evidence of safety and efficacy neither does—nor feasibly could—exist. In these cases, how should practitioners responsibly innovate? Thanks to Paul Ohm and conference co-sponsor Ryan Calo for inviting me to participate, to the editors of the Colorado Technology Law Journal, and to James Grimmelmann for being a worthy interlocutor over the past almost-year and for generously unfailingly tweeting my work on Facebook despite our sometimes divergent perspectives. James's contribution to the symposium issue is here; I don't know how many other conference participants chose to write, but issue 13.2 will appear fully online here at some point. If you would rather hear, than read, me drone on about the Facebook and OkCupid experiments (and some other recent digital research, including Apple's ResearchKit and the University of Michigan's Facebook app-based GWAS, "Genes for Good," as well as learning healthcare systems and the future of human subjects research) you may do so by listening to episode 9 of Nic Terry's and Frank Pasquale terrific new weekly podcast, This Week in Health Law. Because it was a series of network-related posts that led to my invite to guest-blog here at the FacultyLounge, I thought I’d start things off with another interactive network and a discussion of networks more generally. The network below (click-through the image for an interactive version) is an alternate projection of the law prof twitter network. I’ve taken the law prof follower relations and changed the unit of analysis to the school that each prof teaches at. 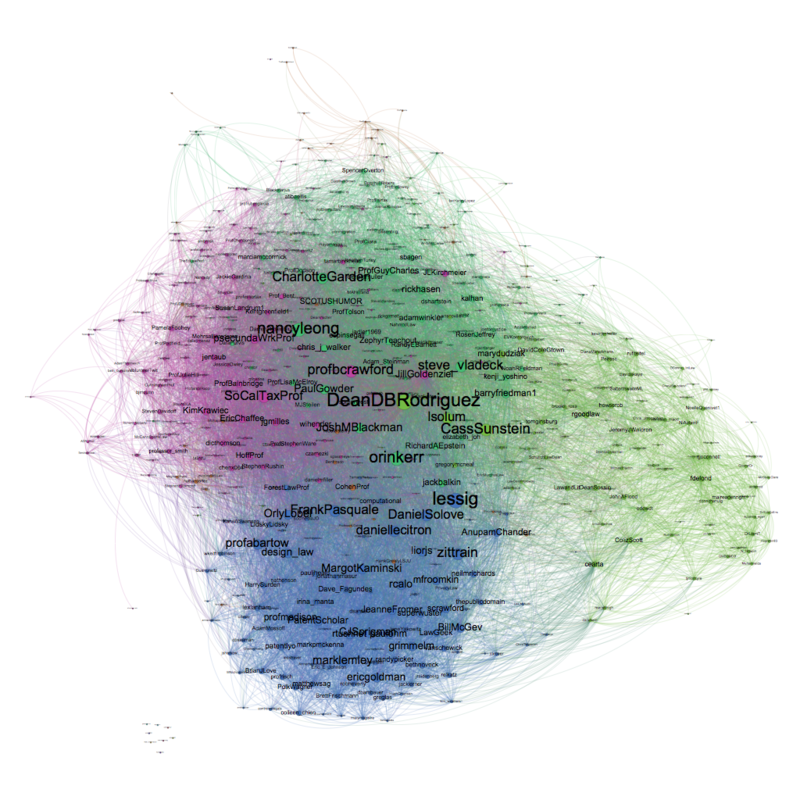 This shows us an electronic social network of law schools. Schools that are strongly linked in this network have a lot of profs following one another on twitter. The larger a school’s node, the more influential it is (as gauged by twitter followers) in the law prof social media world. This network shows three distinct communities. I’m not convinced the distinction between the red/blue communities is really very meaningful, but the green community is quite clearly mostly made up of European schools, and we see Canadian schools bridging the Atlantic divide. This shows that while geography probably only matters to a small degree in forming these relationships, national borders appear to be very important. I've used clickers since I started teaching. In some classes/lessons, I use them extensively. For example, my novelty and statutory bars sections of patent law are almost all clicker exercises, where I vary the hypotheticals just slightly to test the outer limits of what constitutes, say, "public" use. I think of it as lightning-round Socratic method, except that everyone participates. I also like to use them because it forces the students to take a position. I routinely get many more votes than I do hands raised when I just ask. I also find that clickers embolden some to speak up, because when I show the totals and that many people agreed, students are more likely to raise their hands and explain their answers. This is helpful, because it allows me to figure out whether the class is understanding the material and, if not, to find out why. The clickers can also scare students off - if only one picked an answer, he or she is less likely to volunteer why. It frequently happens, though, that the minority of one was correct or recognized some nuance in the question. Thus, I use a belt and suspenders approach - get clicks, ask for hands, and then show the results and ask for more volunteers if need be. I recommend clickers to anyone not using them. I find them helpful and my students have responded positively for years. But as the ABA moves toward requiring formative assessments (Standard 314), I wonder whether the clicker slides are enough. On the one hand, the students answer questions and we discuss right, wrong, and iffy answers and they can judge for themselves if their responses were correct. But maybe that's just me being lazy and not wanting to do more work to change my methods. Perhaps it would be better if I required everyone to answer (my participation rate runs at about 2/3) and graded answers (I have colleagues that do this). I don't know the answer to this question. On the one hand, the students are responsible for their own education and should participate as they wish to their benefit or detriment. On the other hand, maybe it would be better to have more grades spread out throughout the year. I'm not sure my students would like that so much, but the educational results may end up improved. For those who followed my posts on law professor use of Twitter, I thought this recent article, called "The Unbearable Lightness of Tweeting," at The Atlantic was illuminating. The gist of the article was an author's self-study of the rate that users click through to read an article. The results leave a lot of questions about the information sharing value of Twitter, not just for law professors, but for everyone. Those of you on twitter should feel free to join me tonight as I host a Bioethx chat on Reverse Transplant Tourism. Given that I am a twitter moron, still don't understand hashtags, and find it hard to even understand much tweet shorthand, this could be fun. Continuing my series of posts on professors and social media, I thought I would write a few words about Facebook. I have less to say about Facebook than Twitter, in part because I don't have data and in part because I think that most professors use Facebook like any other such user, to connect with family and friends, share photos, etc. There are, of course, a few professors who use Facebook to only share their own work or other information specifically related to their areas of interest. I tend to tune those users out, for the same reason I tune out much of my Twitter feed. I just don't have time to absorb all of it. So, what is there to say about Facebook and Academia, then? I think there are a few relevant points, which I categorize into "everyone" and "career sensitive" (e.g. junior) professors. 1. I find that academic life can be very insular. Facebook can fight this tendency to the extent that Facebook friends are not part of the academy. For example, my high school classmates are a diverse group and the stuff they talk about and articles they share give me a sense of what's happening outside of my own social group and outside media portrayal of particular events and debates. Indeed, the list of "trending" shared news stories that Facebook provides is interesting, if only because I almost never see those news stories being shared by my Facebook friends. This serves as a good reminder that what's important to me is not important to everyone. 2. I've found that stories shared by friends on Facebook are more diverse than stories shared on Twitter, even by those same folks. I'm not sure if this is really true, and if so, why. I know it is for how I use the two platforms. My guess is that people see their Facebook viewers as a more diverse group, which is a bit ironic considering that Twitter is public. But it may be the limited audience that makes a difference - by not sharing with the world, you can be free to share information outside of your normal professional zone. But it may be that not everyone should share outside their professional zone. Career sensitive users might want to consider whether Facebook use harms them in any way, and if there is a way to manage it. Note that I offer these thoughts as an observer and not a practitioner. I don't separate sharing lists, so my professional colleagues get pictures of my kids and groans about football losses. Similarly, family and non-academic friends are treated to my wonky ramblings about policy issues. It turns out that there's some overlap in each group, so YMMV. So, what are some career sensitive concerns? I discuss a few below; some are more cynical than others, but while I'm plumbing the depths of social media by law professors, even the cynical views deserve an airing. 1. Your true personality may shine through. Now, ordinarily this is a good thing, but we all have flaws. I've heard more than one person (in academia and otherwise) say that an interesting thing about Facebook is you often find things out about people that you really wish you hadn't known. And, so, this can affect how people think about you. 2. Your true political leanings may shine through. Similarly, the things one says and posts on Facebook will help others form a more complete picture of where you stand politically. Indeed, this is one reason why I hate election cycles on Facebook. But if you are career sensitive, then (I am sad to say) your political leanings might make a difference to others who read your posts. 3. Your work habits may be misinterpreted. To the extent that professors use Facebook often, but only post about non-professor things, there is a chance that others might wonder whether you are actually doing any work. This, of course, is a cruel judgment. After all, shameless marketing is frowned upon, but it is so prevalent that when you are not doing it, it stands out. 4. You might just rub some people the wrong way. It happens, and there's nothing you can do about it, but it's a risk to consider. I'll give a couple of my own examples. First, on more than one occasion I've offended senior colleagues/mentors with snarky comments about the academy. These were comments I'd never make seriously or "publicly," but that I stupidly felt appropriate as a Facebook comment. Second, I had a colleague - one I communicate with regularly in other ways - unfriend me after one too many poopy diaper stories. I haven't told a poopy diaper story in years, but I tell plenty of other stories about things my kids say and do and to this day we still aren't Facebook friends. Those are just a few thoughts; most of them are probably obvious, but I thought it might be helpful to put them in one place. Below the fold is Version 3.1 of the census of law prof Twitter users. Of the 672 faculty members included on this list, 415 are male; 257 are female. By way of comparison, Version 3.0 (here) from January 2015 had counted 553 faculty members -- 330 male, 223 female. Version 2.0 (here) from July 2012 had counted 204 faculty members -- 142 male, 62 female. The beta version (here) had counted 93 users. All additions and corrections very welcome for future versions (at this time, there is no specific planned future publication date). Feel free to use the comments or email me directly at bcrawford *at* law *dot* pace *dot* edu. Responsive signed comments with full names and email addresses only; all other comments will be deleted. I compile the list based on information sent to me or that I happen to stumble across. The list notably lacks law professors from non-U.S. jurisdictions, so please share info as you have it. I welcome all additions and corrections. As before, the list covers individual law professor tweeters only (not accounts of groups, programs, law schools, publications, students, practitioners, staff). To be included, one must be a full-time law school faculty member (not, say, a law-trained prof working in a business school). Lisa Larrimore Ouellette (Stanford) (@PatentScholar) has created a Twitter list that makes it easier to follow all of the professors listed in the census. You can subscribe to the list at Professor Ouellette's Twitter page here. Ryan Whalen's "Law Prof Twitter Network"
Over at his eponymous blog (here), Northwestern JD/PhD candidate Ryan Whalen has some interesting visuals and data based on the Census of Law Professor Twitter Users 3.0. One sample is below. View Mr. Whalen's full post here.